Layout of SFS fields, directions to our fields, and other considerations when visiting us. Santa Fe games are played at North Pope Park (U6-U8) and South Pope Park (U10 and up). 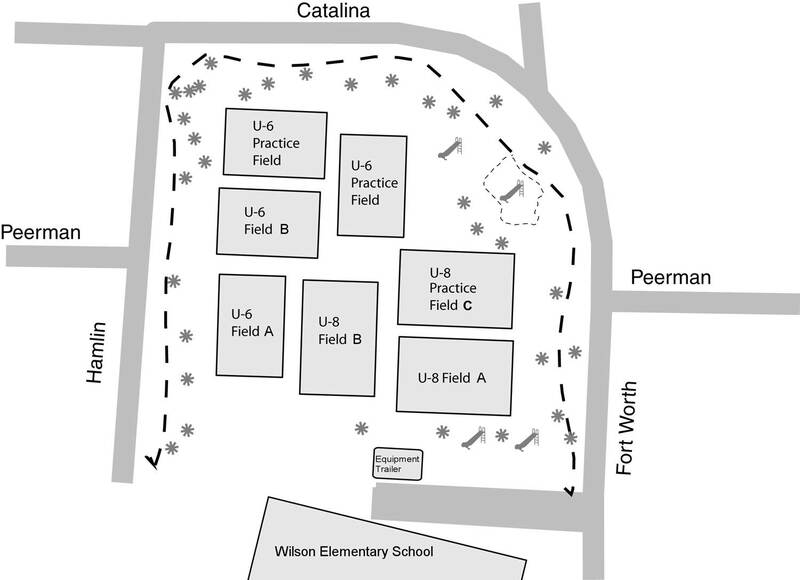 These parks are located either side of Wilson Elementary School, between Alameda and South Staples. We also have some U13 and up games at Annapolis Christian Academy. They are located across Staples from Hamlin Middle School. Santa Fe Soccer Club fields are located within a neighborhood and we’re adjacent to houses and local residents. The basic rule for our parking plan is that we ask soccer parents, friends, and visitors to not park in front of residences. We are asking everyone to park next to the park only or in the Wilson/Calk or Hamlin school parking lots. The main exception to this along Driftwood, where there is already no parking allowed next to the park. 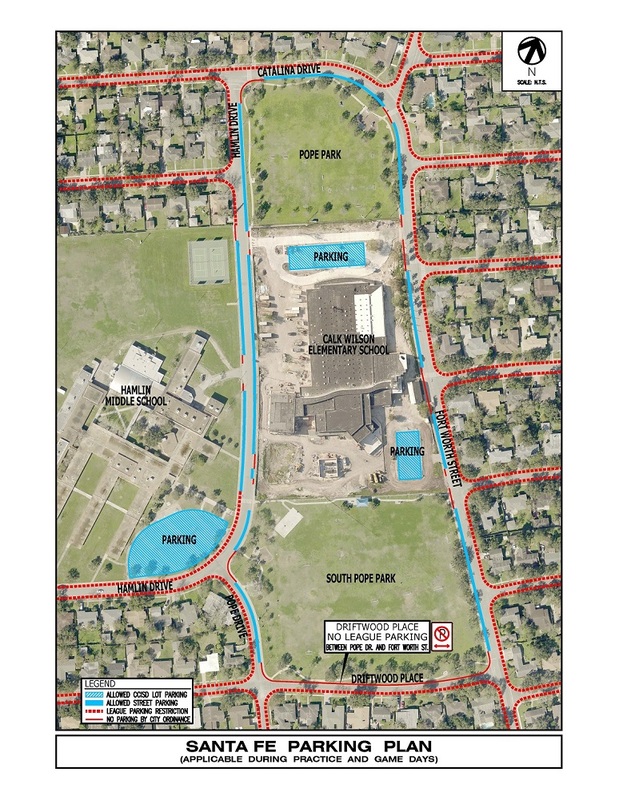 As mentioned above, the Wilson/Calk and Hamlin parking lots are available for use and additional parking is available on both sides of Hamlin Drive next to the school. A map of places to park and not park is shown below. We ask that you observe these new parking rules for practices as well as games. This is a departure from past practices, but with everyone’s help and patience we can make this a success. Please help us be good neighbors with local residents. Please note that we do not have restrooms at our fields. We play at a City Park, but unfortunately don’t have restrooms. At the corner of Staples and Doddridge/Weber there is a Stripes as well as a McDonalds that have facilities. We apologize for any inconvenience. When visiting, please help us keep the fields and the park clean by picking up any litter. We appreciate your help!